Many suffer from Migraines. Thanks to Allergan, we know that Botox can help, but there may be something safer and cheaper the can help, too. 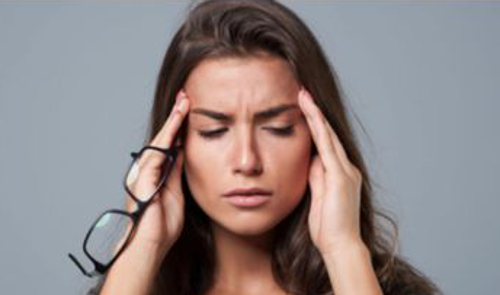 A lot of my San Francisco Bay Area Plastic Surgery patients suffer from Migraine Headaches, so I looked into the incidence of Migraines and found that according to the Migraine Research Foundation, it is the third most prevalent and the eight most disabling illness in the world. In the U.S., 18% of women, 6% of men and 10% of children suffer from migraines, and I have found this to be true within my own patient population. About 80% of Migraine sufferers have a positive family history. It runs in my family. I had a few myself, but I seem to have outgrown them. Thankfully, mine were few and far between, and they seemed to be associated with sleep deprivation. So diet, exercise and regular sleep were enough to keep them to a minimum, but others are not so lucky. Every 10 seconds, someone in the U.S. goes to the emergency room complaining of head pain. While most sufferers experience attacks once or twice a month, more than 4 million people have chronic daily migraine, with at least 15 migraine days per month. My observation of an association between Migraines and sleep is not unique. One of the most commonly cited triggering agents happens to be changes in sleep habits. Insufficient sleep, greater than normal sleep, disturbed sleep or alterations to daily bedtime or waking all have been strongly correlated with initiating migraine attacks. Recent research suggests that some migraineurs might be deficient in melatonin production. A nap can cure a Migraine, but sleep may also be preventative. According to a well referenced online article by Dr. Mathew Long, Melatonin (a derivative of serotonin) is manufactured in the pineal gland at night, and it functions to regulate the sleep-wake cycle. Furthermore, it has been implicated in migraine pathophysiology due to its anti-inflammatory effects, ability to scavenge free-radicals, inhibition of dopamine and stimulation of nitric oxide synthase. Melatonin also has a role in membrane stabilization. With sleep-related factors featuring so prominently in migraineur’s lives, it makes sense that we examine the relationship between poor sleep hygiene, melatonin synthesis and the tendency to migraine. Research has linked low levels of melatonin in plasma and urine and altered peak time in melatonin levels to a variety of headache types, including migraines. Melatonin has been available as a supplement in the United States since the 1990s and is often used to aid sleep and attenuate jet lag. A study in published in Neurology in 2004 showed promising results in migraine prevention when 3 mg of melatonin was taken 1 hour prior to bedtime. 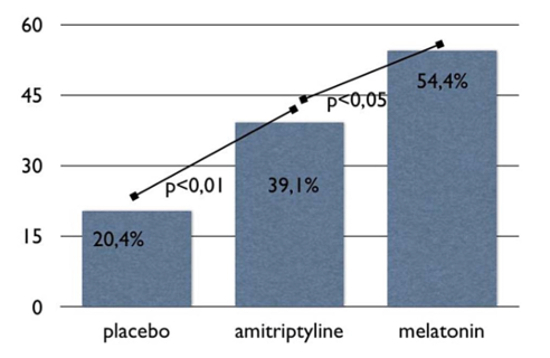 This was confirmed 10 years later when Melatonin was compared head-to-head-to-head with amitriptyline and placebo. As reported on Medscape, results from a multi-center, randomized, double-blind, placebo-controlled trial showed that 3 mg of melatonin was more effective than placebo and had efficacy similar to that of 25 mg of amitriptyline. Furthermore, it was better tolerated than amitriptyline, with lower rates of daytime sleepiness and no weight gain. The principal investigator, Mario Peres, MD, PhD, published the Randomized clinical trial comparing melatonin 3 mg, amitriptyline 25 mg and placebo for migraine prevention in the Journal of Neurology, Neurosurgery & Psychiatry. He also presented his results at the 65th Annual Meeting of the American Academy of Neurology. To test the efficacy and tolerability of melatonin and amitriptyline vs placebo for migraine prevention, the investigators recruited 178 men and women who met International Headache Society diagnostic criteria for migraine with and without aura and who had 2 to 8 migraine attacks per month. All patients underwent a 4-week baseline phase during which each participant kept a diary of migraine frequency.Participants were then randomly assigned to receive 3 mg melatonin (n = 60), 25 mg amitriptyline (n = 59), or placebo (n = 59) for 3 months. Medication was taken between 10 and 11 pm daily. The study’s primary outcome was a reduction in the number of headache days per month. Secondary endpoints included migraine intensity and duration and analgesic use. Tolerability was also measured in all 3 study groups. The mean reduction in headache frequency was 2.7 in the melatonin group, 2.18 in the amitriptyline group, and 1.18 in the placebo group. Proportion of responders (patients with a higher than 50% improvement in headache frequency, number of migraine headache days) comparing baseline vs last month of treatment. Although migraine frequency did not differ between the 2 active treatment groups, the proportion of responders was greatest in the melatonin group: 54% vs 39.1% for amitriptyline and 20.4% for placebo. Melatonin was also “very tolerable” and had significantly fewer adverse effects compared with amitriptyline. Daytime sleepiness was the most frequent symptom in all 3 groups but was most pronounced in the amitriptyline group (n = 24). Although patients gained weight in both the amitriptyline (n = 3) and placebo (n = 1) groups, melatonin was associated with weight loss. Timing of administration and formulation is also important. Ideally, melatonin should be taken between 10 pm and 11 pm to mimic the physiologic peak. In addition, a fast-acting rather than a slow-release formula should be used. Overall, said Dr. Peres, the study’s findings are promising and warrant further research. If you suffer from Migraines, Melatonin, a relatively inexpensive and safe over-the-counter supplement may help. I am not recommending you base your treatment on the blog post of a San Francisco Bay Area Plastic Surgeon. You should see a real headache doctor and have the appropriate testing and examinations performed prior to initiating treatment. However, when you see your doctor, if they do not bring up Melatonin, be certain to ask.